One of the best ways to keep your floors as clean as possible, reduce allergens and sickness in the home, and extend the life of your flooring; is to remove your shoes as soon as you enter the home. 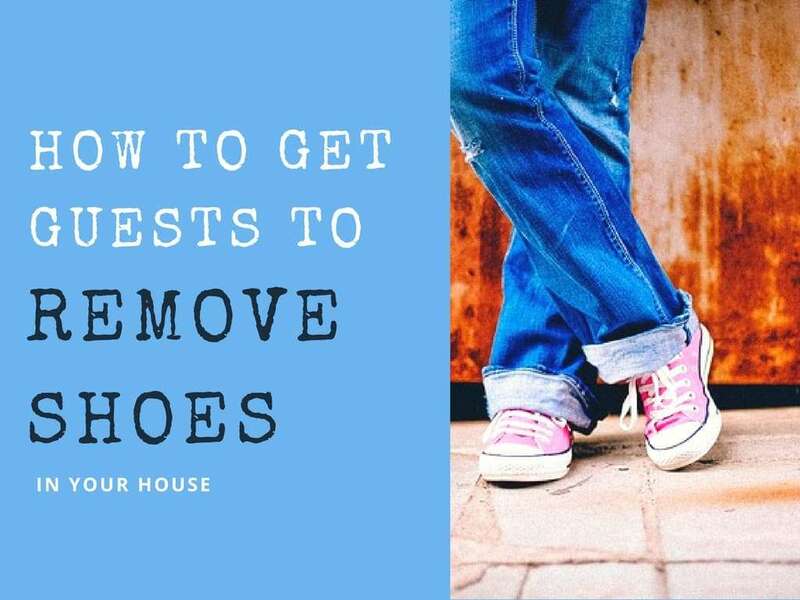 The no shoe in the home policy is a very beneficial one, but can become awkward when you have guests over and would like them to remove their shoes as not every guest you have in your home will use the no shoe rule themselves. No shoes is a tough house rule to implement with guests. It is your home so it should be your rules, but you also want to create a nice warm and welcoming atmosphere that makes your guests feel comfortable so they will want to stick around. Not every person is comfortable going shoeless especially in another person’s home. Here are some things you can do to make your guests feel at home and maybe even wanting to remove their shoes as soon as they step in the door. Put up a cut little sign by the door either inside or outside with a clever or cute saying asking guests to remove their shoes. Put a large basket or boot tray right next to the door and even leave a few pair of shoes there if this is not your main entry into the house. If you have guests coming in right after you remove your shoes and they will more than likely follow. When requiring shoe removal have a box of free socks, slipper socks, or slippers available to gift your guests. Have a little fun with it and offer a variety of different styles and colors. In warmer months you may want to offer flip flops they can use as outdoor shoes later if they like. Who can resist wanting to step on a clean and inviting plush rug? Set a couple around your entertaining space to make removing shoes seem way better than keeping them on. This is especially helpful if you have hard surface floors. If you have the funds to do so, why not put the heat in your home in the floors? When it’s a bit chilly out who would rather leave their shoes on than take advantage of a nice toasty heated floor? Provide a cozy place for your guests to take a seat and remove their shoes. A nice nook, cubby, or bin to place their shoes, a place to hang a coat or leave a handbag, etc. These things help to welcome a guest to get comfy as well as provide clues to shoe removal. Shoes are great, but they also carry a great deal of germs and dirt around on their soles. Removing shoes prevents a large amount of debris from coming in contact with your floors and you. For more great carpet care tips please browse our blog. Make an appointment with All Kleen for all of your carpet cleaning needs.